Cheyenne winning best of breed under judge Geraldine Taylor. Health: Hips good, thyroid normal, eyes CERF normal. About Cheyenne . 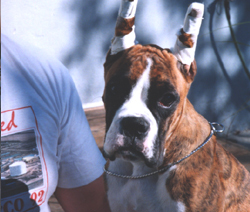 . .
Cheyenne was the first Boxer to teach us that Boxers really do bark. She may be small but she is mighty, and everyone in the neighbourhood knows it. Cheyenne is the last of our original line and was tested for hips, heart, and eyes. She is a blessing and a true joy to have in our home. She has the blackest, most expressive eyes we have ever seen in a Boxer. Cheyenne’s show career . . .
Cheyenne wasn't shown until she was a year old. Once she hit the show ring, there was no stopping her. She was a little spitfire that flew around the ring with grace and ease. Cheyenne finished her Canadian championship with Dave on the end of the lead in only two weekends. She was not shown after she finished her title. In May 1996, Cheyenne won best of winners under judge, George Taylor. 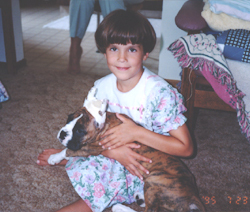 In May 1996, Cheyenne won best of breed under judge, Geraldine Taylor. 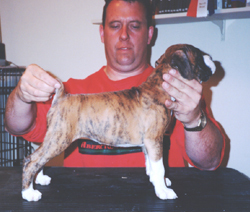 In July 1996, Cheyenne won best of breed and obtained her Canadian championship under judge, Pat Miller, and then won best of breed under breeder judge, Sheila Verhulst. Cheyenne at various stages in her life . . .
Cheyenne at 12 weeks (with Amanda).